This step by step diy project is about farmhouse side table plans. I have designed this side table so it is easy to build. but I haven’t made any compromise with the style of the project. 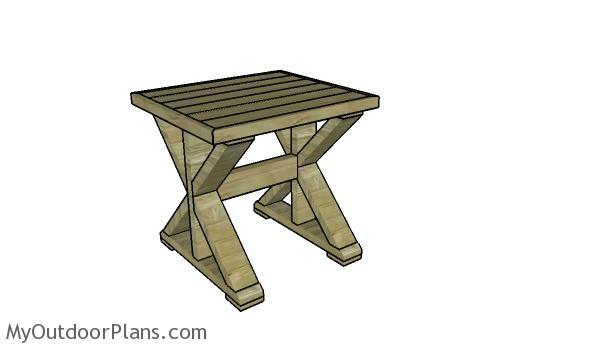 Moreover, this table should cost under 20 $ to build, making it a really great choice for a first woodworking project. Take a look over the rest of our woodworking plans, if you want to get more building inspiration. The first step of the project is to build the base for the farmhouse side table. 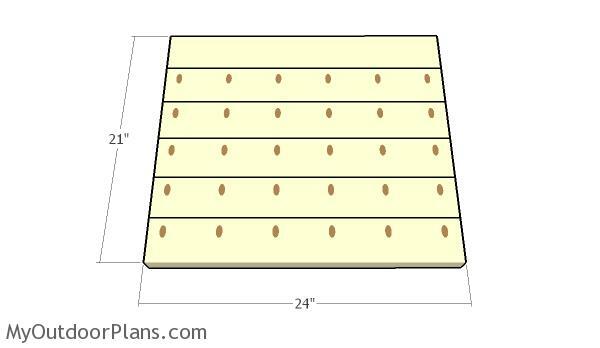 As you can easily notice in the diagram, you need to make 45 degree cuts to both sides of the slats. Smooth the edges with sandpaper for a professional result. Next, you need to build the sides for the side table. 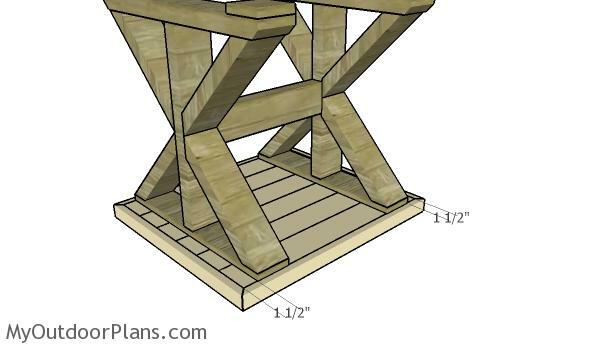 Use 2×4 lumber for the main leg and 1×4 lumber to the top support. 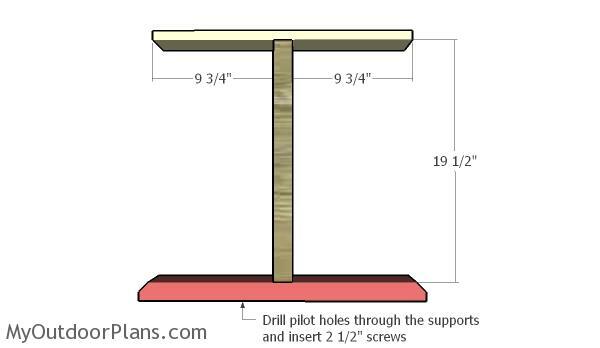 Drill pilot holes through the base and through the top support and insert 2 1/2″ screws into the main post. Make sure the corners are right-angled and add glue to the joints, before assembling everything. 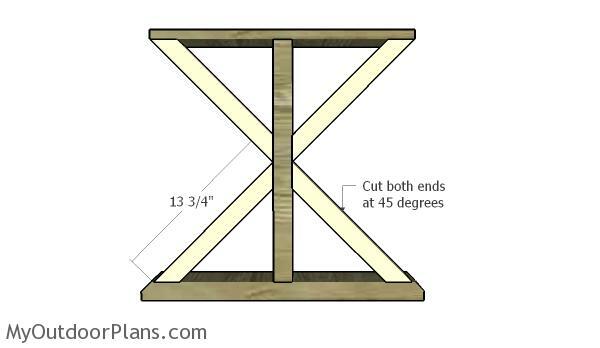 Build the braces from 2×4 lumber. Cut both ends of the braces and fit them to the sides. Drill pilot holes and insert 2 1/2″ screws into the frame. Leave no gaps between the components and add glue to the joints. Cut 3 1/2″ pieces of 1×4 lumber for the base of the table. Use glue and 1 1/4″ brad nails to secure the pieces to the base components. Smooth the edges with sandpaper for a professional result. 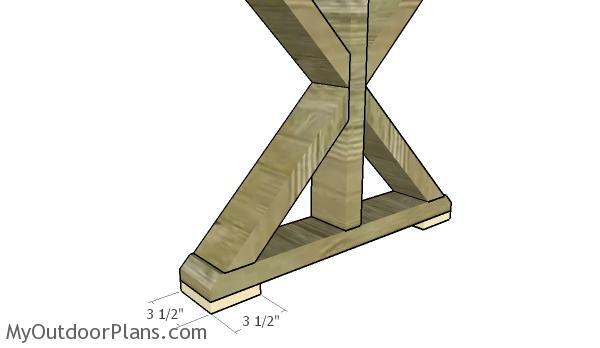 After assembling the sides of the table, you need to assemble them by fitting the stretcher. Drill pocket holes at both ends of the supports and secure them to the sides with 2 1/2″ screws. Make sure the corners are right-angled and leave no gaps between the components. 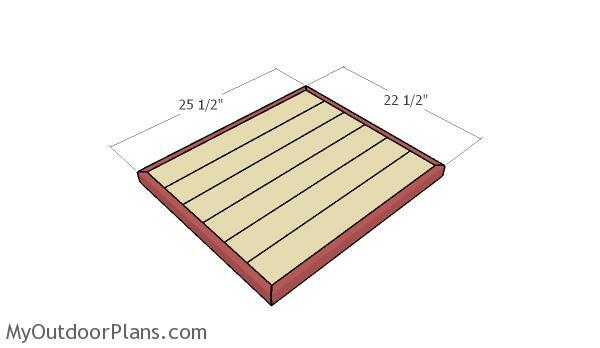 Continue the project by assembling the tabletop from 2×4 slats. 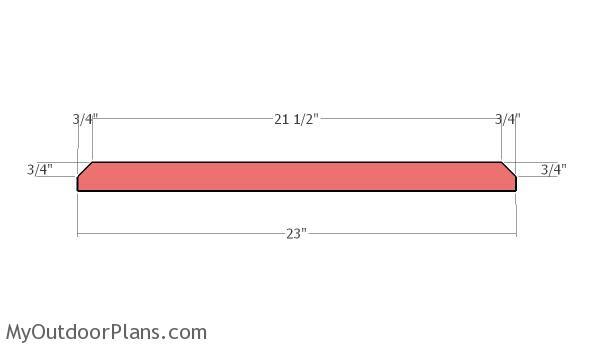 Cut the slats at 24″ and drill pocket holes, as shown in the diagram. Add glue to the joints, align the edges and clamp them together tightly. Use 2 1/2″ pocket holes to secure the slats together tightly. Smooth the edges with sandpaper for a professional result. Build the trims for the tabletop from 1×2 lumber. Cut both ends of the trims at 45 degrees. Use 2″ brad nails and glue to lock the trims to the tabletop. Align the edges with attention for a professional result. After assembling the tabletop, you should lay it on a level surface. 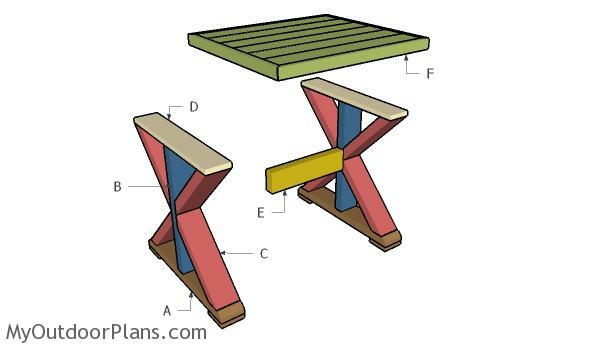 Center the frame of the table to the top, as shown in the diagram. 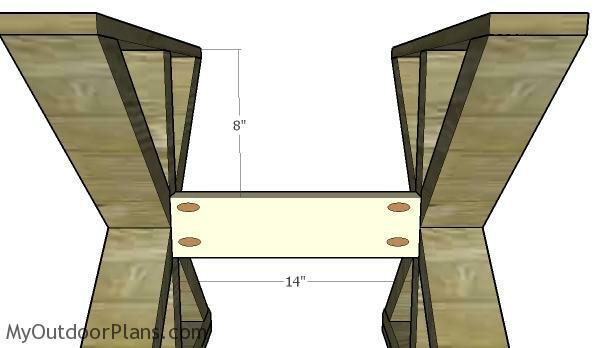 Drill pilot holes through the supports and insert 1 1/4″ screws to lock them together tightly. Add glue to the joints for a stronger bond between the components. 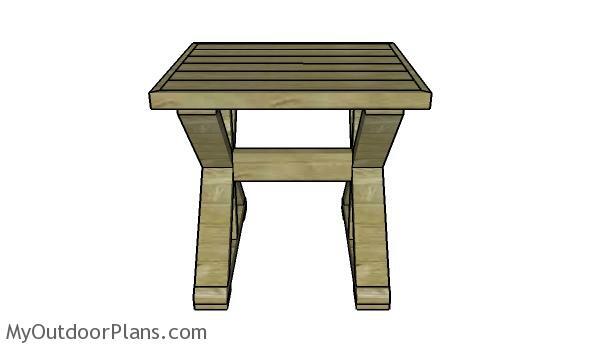 Now that you have assembled the outdoor side table, you need to take care of the finishing touches. Fill the holes and the dents with wood putty and smooth the surface with 120-220 grit sandpaper. Apply a few coats of stain and then seal everything with spar varnish. This is a super simple project anyone should be able to build in a day without much effort. Remember that you need to adjust the size of the components so they suit your particular own needs. The best step of the project is that you this design will match any style of outdoor furniture. Moreover, you can even use the side table for your house, if you enjoy the x-shaped legs. This woodworking project was about farmhouse side table plans free. If you want to see more outdoor plans, check out the rest of our step by step projects and follow the instructions to obtain a professional result.